Unlike us, dogs are not able to perspire, relying only on their primitive panting behavior to release excess heat trapped inside their bodies. 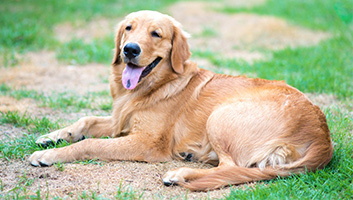 Even thin coated pooches can suffer from excessive heat since the panting mechanism is simply insufficient to cool their body down especially on warmer days. While you can put them in a fully air-conditioned room or aerate their kennels or dog crates with an electric fan, you’ll end up with a heftier energy bill at the end of each month. A dog cooling mat can help address these issues by cooling off your dog’s body while saving you hundreds of dollars on your annual energy expenditures. Sadly, not all pet chilling units are designed in exactly the same way. You don’t need to worry though as we’ve prepared a listing of the best-rated dog cooling pads in the market. This list is the product of a long and thorough research to provide your dog only the best. Arf Pets’ canine cooling mat is quite expensive yet enjoys the trust of a number of dog owners who happen to vouch for its effectiveness in lowering the body temperature of their respective furry 4-legged friends. What separates the Arf Pets from similar products is the duration of its cooling effects, reaching up to 3 hours before your pet needs to move out of the pad to allow it to dissipate the collected heat into the surrounding air. Within 15 to 20 minutes, it should be ready to absorb your pooch’s body heat again. There really is no need to plug it in any socket or attach it to any battery power as the gel only needs several minutes to release trapped heat into the immediate environment. 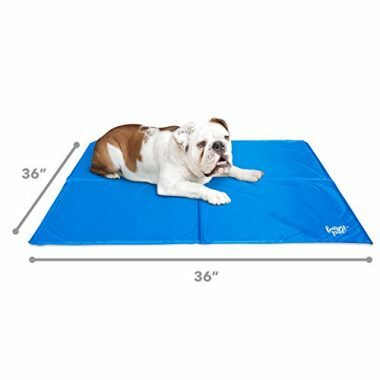 The solid construction of the Arf Pets dog cooling mat is something that we admire. Again, it may look flimsy but if we are to trust the reviews of consumers, it is definitely a tough and durable product. The gel embedded into its design is also made of non-toxic materials so there should be no worries in that department. It’s also waterproof allowing for a simple wipe to get it clean. If we have to consider the number of pet cooling pad reviewers as the sole parameter for its effectiveness, then The Green Pet Shop’s Premium Cooling Pet Pad should easily take the number 2 spot. The Green Pet features the same technology like the rest in this list, instantly activating its cooling effect with the mere presence of your pooch’s body on the durable, mold resistant, and waterproof panel. What is really astounding is that, depending on the core temperature of your doggie including its body size, the temperature reducing effects of the Green Pet can last as long as 4 hours whereas other products can only manage 2 hours at best. We firmly believe this is something that most dog owners will appreciate in the Green Pet Shop pet cooling pad. The longer its chilling effects the better it is in bringing comfort for your pet. At any rate you’ll be ensuring the optimum wellness of your doggie as it will not have to be irritated with the extreme heat trapped inside its body. The Green Pet is machine washable; however, we understand that it’s best cleaned using a clean piece of cloth that’s soaked in a solution of mild soap and water. Cooling your dog should never be a problem with the Cool Bed III from K&H. Unlike other pet cooling beds that require you to put the contraption into your fridge or some other cooling mechanism, the Cool Bed III relies on the cooling efficiency of water to bring your dog’s body temperature down to as low as 22 degrees. Filling the Cool Bed III with water is very easy since it already comes with an easy-twist, easy-fill cap that is also guaranteed to be leak proof. Once the bed has been filled with water and adjusted to the preferred level of ‘softness’, you can easily place it on any surface and your dog will already be treated to one of the most effective ways to cool down on a hot summer day. There’s no need to refill the Cool Bed III for up to a year, especially if you choose to add a few drops of grapefruit seed extract in the water to help keep bacteria and other germs at bay. With its tough vinyl, nylon exterior, the Cool Bed III offers so much more than a simple cool place for your pet to lie down. It’s a great choice for keeping your hound comfy and well-rested regardless of how hot it can be outside. The dog cooling mat designed by the American Kennel Club looks like a 4-fold solar panel with each panel embedded with gel cooling technology. The sections that make up the space in between the panels are thin enough allowing it to be neatly folded. The AKC pet cooling pad is available in 3 sizes and colors and features a dirt repellent and water resistant construction. We really couldn’t find anything that will separate the AKC unit from other products except for the fact that it’s made by one of the most reputable organizations in the dog world. Plus, it comes off as a very inexpensive alternative to other products. Surprisingly, the AKC gizmo works whether it is for outdoor or indoor use. At the very least you will have another option to consider in your search for the best cooling pad for dogs. 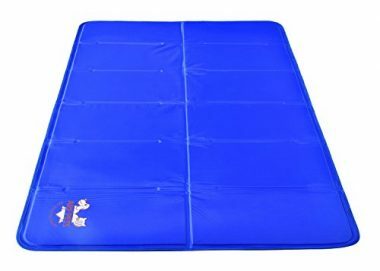 It may not be an actual bed, but the Dogbed4less Pet Mat is something that you’d definitely want to consider if you want your dog to have one of the best cooling surfaces it will ever rest its tired body on. 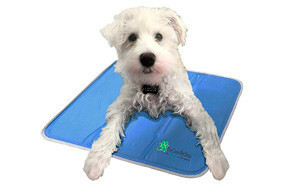 Featuring a unique design that integrates cooling gel right into its 4-lb rated memory foam that easily conforms and hugs the undulating shape of your dog’s body, this doggie cooling mat is perfect for those who simply cannot sleep because it’s too hot. 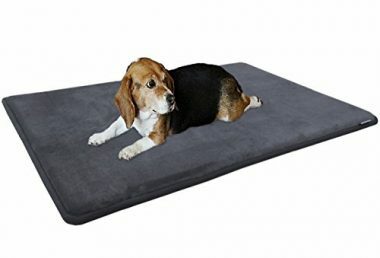 The use of memory foam makes it great for canines with joint problems or those that are recuperating from an illness or surgery or even elderly hounds that may already have reduced mobility. It also comes with the Ultra Fresh treatment that effectively renders the pet mat’s surfaces free from harmful microorganisms especially mold and mildew. 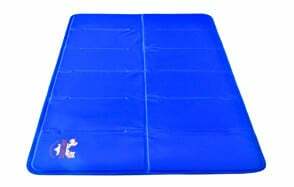 Underneath is an eco-friendly backing made of waterproof and anti-skid SBR rubber, keeping the Dogbed4less pet mat in its place. It may not have a fancy or stylish design, but the Dogbed4less pet mat is effective not only in keeping your dog cool and comfy but also in supporting its tired body. It’s a luxury pet mat that is versatile enough to be used on almost any other surface. 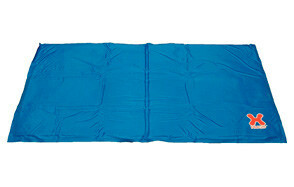 FrontPet’s large dog cooling mat actually resembles the 4-panel soft gel design of the AKC canine cooling mat. The only difference, of course, is that it comes from a different company. 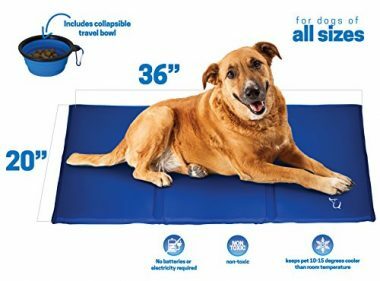 Regardless, the FrontPet’s 4-panel folding design should be great enough to provide a cool surface for your doggie to lie on since this product is only available in one size of 36 x 36 inches. The FrontPet also comes with the same gel technology like the rest of the products in this list, providing you with the guarantee that it works. Unfortunately, 1 of 5 consumers think that the FrontPet is not sturdy enough since gel leaks were noticed on the surface of the product after only several days of use. While this is a very valid concern, we cannot detract from the fact that the FrontPet can draw heat from a dog’s body to cool it down, bringing comfort in the process. Furthermore, the gel is designed to be non-toxic so it should be perfectly okay for dogs to nip at it should it leak out. Of course, this defeats the purpose of the whole product since leaking gel means reduced cooling capabilities. And since it is priced rather higher than other similar products, then its overall value somehow diminishes. Nonetheless, if you’ve got a pooch that’s not really a very tenacious clawer, biter, or chewer, the FrontPet is an interesting choice. Lowering the body temperature of your pet especially during the super-hot days of summer can be made a lot easier by using Unleashed’s Pets Large Self Cooling Pressure Activated Gel Pad Mat. This dog cooling mat may look nothing like a temperature lowering gizmo that you have in mind but it really works. It features a gel substance that can easily provide your pooch with up to 2 hours of continuous temperature lowering effects without the need for electricity of batteries. Unfortunately, this same 2-hour effectiveness may not be sufficient especially during the long hot days of summer which may require you to get at least two of these products to provide a 4 hour relief for your pooch. Refilling the coolness of the Unleashed is rather easy, nonetheless, as the gel usually regains its temperature lowering effects within 20 minutes of the pad not being used. The Unleashed’s construction is made of latex-free, durable, puncture resistant, and waterproof materials for ease of cleaning and superb versatility. It only comes in 2 sizes though so your choice of the appropriate pet cooling pad for your pooch may be quite limited especially if you’re thinking of using it as a chilling liner for its crate or kennel. Regardless, Unleashed may not have the numbers of reviews but majority of these have all been on the plus side. 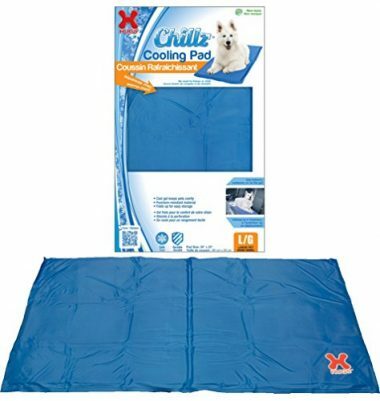 Currently enjoying the accolade of many pet owners, the Chillz large dog cooling mat from Hugs Pet Products is a great temperature lowering contraption that is perfect for all types of dogs as it is available in 3 sizes as well as 3 design patterns. For those who prefer a simpler and unpretentious design, the blue Chillz offers a great choice. Of course, for those who want some flair for their pooches, they can always choose the Realtree Pink or the Realtree Xtra Green. The Chillz looks and feels flimsy, though, having a certain thickness that is somewhat short of one’s expectations for a comfortable pad. It looks more like a thick blanket rather than a pad. Regardless, the use of gel technology that doesn’t require any freezing or chilling processes to provide for its chilling effects should be great in providing comfort for your pooch. It’s puncture resistant, too, although we’ve noticed quite a handful of consumers saying that theirs were punctured after repeated intense scratching and clawing from their respective pets. At any rate, the non-toxic nature of the gel should provide you with peace of mind in the event that your doggie happens to be a very rabid clawer. The other good thing we noted about the Chillz and which many dog owners also report is that it may really look very ineffective but dogs really do love chilling out on this thin mattress type of temperature lowering gizmo. It’s priced relatively less expensive, too, so you get the best value for your money. We understand the apprehension you may have when it comes to buying a canine contraption such as a cooling pad. Most newbie dog owners will readily admit that they are baffled by the sheer number of products that promise to cool down their doggies’ bodies especially in the hot months. This is why we’ve come up with something that will help you gain a better understanding of what this device is for, how it works, and the various features that you need to be looking for in one. Hopefully towards the end of this buying guide you will be more than ready to make the correct decision as to which product to choose for your dog’s cooling needs. What is a Cooling Pad for Dogs? 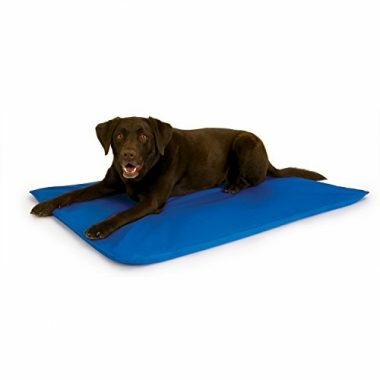 As the name implies a cooling pad that is specifically designed for canines is a mat that aims to lower the core body temperature of pets. There are 2 fundamental types of these products available in the market. These include the following. These are almost synonymous to the waterbed that we know and some of us actually use in our homes. It is filled with water as the principal heat absorbing substance of the product. Unfortunately, this has fallen out of favor since it is heavily dependent on the integrity of the fabric that contains the water inside. A small puncture can render it unusable, although some can easily patch it up to extend its utility. These cooling pads are now preferred over water-filled products as it is relatively low maintenance and a lot easier to clean, too. Moreover, most are flexible and portable that they can be easily stored into almost any space. If you remember those anti-fever patches that we place on our kids’ foreheads every time they have fever, these are almost similar to the gel cooling pads for dogs. To appreciate how cooling pads work it is imperative to understand how thermal energy is transferred from one object to another because this is technically what is occurring in such canine products. It should be remembered that the movement of thermal energy typically occurs from an object with a much higher temperature to another object or even space that has substantially lower temperature. Let us take a look at the two methods of heat transfers that occur in cooling pads. In its simplest form, conduction is the movement of heat from a higher temperature source to a lower temperature destination. We are not going to go into deeper detail as to the principles of physics involved in such a process. What is sufficient to understand is that heat molecules will move from an area with higher temperature to an area with lower temperature. Let’s try to illustrate this using our canine cooling mat. These devices have a much lower temperature provided by either the water or the gel that is contained within the bladder or compartment of the pad. The dog’s body is generally warmer, having higher temperature relative to the pad. As such, the heat will move from the dog’s body and into the pad. This is the very basic explanation as to how canine cooling pads actually work. Now, the efficiency of the heat transfer is quite dependent on several factors. For example, the difference between the temperatures of the origin (dog) and the target (pad) can play a role in the duration and effectiveness of the heat transfer. You see, heat transfers from one point to the next as long as one of these points is either higher or lower than the other. The net movement of thermal energy stops once equilibrium has been established. Simply put, if the temperature of the pad is already equal to the temperature of the dog, then conduction stops. As such, if you have a cooling gel that is several tens of degrees colder than the dog’s body temperature, the longer will be the cooling effect since it takes time to reach equilibrium. Conversely, the smaller the temperature difference or gradient between the dog and the pad, the shorter the duration of the pad’s cooling effectiveness. Another factor that you need to consider is the thickness of the pad since heat will have to travel across the entire gradient of this object. The thicker the pad the greater is its cooling effectiveness since it will be able to accommodate more heat molecules coming from the dog. On the other hand, a pad with a smaller surface area and a thinner cross-section will heat a lot faster. The physical properties of the heat-absorbing elements in the pad also play a factor in heat transfer efficiency. Water can absorb heat relatively well, but synthetic gels have physical properties that allow them to absorb more heat, thus prolonging their cooling effectiveness. Now, the more gel substrate one has in a particular product, the greater will be the product’s cooling effectiveness. Once the temperature of the cooling pad is already at equilibrium with the dog there can no longer be any net movement of thermal energy between the two. As such, thermal radiation begins to move heat away from the source and into the surrounding air. Just think of the sun which continuously emits thermal radiation. Applying this concept into our canine cooling pads, the heat that was ‘absorbed’ from your dog will have to be dissipated into the surrounding air. Since the pad is now ‘hotter’, it will be more efficient in radiating this ‘heat’. This is how cooling pads get ‘recharged’. Be sure to read our review of the best heated dog pads for some great alternatives for when the temperature drops. Now that you know how cooling pads for dogs work it’s time to look into the various features that should help you decide on which product to buy. You have learned that the thermal efficiency of a canine cooling mat can be affected by a variety of factors such as the temperature gradient between your dog and the mat, the cross-section of the product, and the physical properties of the substrate being used in such products. It is for this reason that while different products may have the same features they can vary in their thermal efficiency with some units able to cool your dog for a good 2 hours while others can do it for 4 to 5 hours. Common sense will tell you that it is better to get a product with a significantly longer cooling effect. However, this is not the only factor that needs to be considered. You also need to check the radiation capability of the pad. Some units can return to their original state within 10 minutes while others may require a longer time. For other products to help relieve the discomfort of hot weather, make sure you read our review of the best cooling vests for dogs. Choose a product that will last several years and not just a few days. Unfortunately, many of these products often are no match to a really tenacious chewer or clawer. Regardless, the durability of materials should always be considered in your decision. Cooling pads are not the only products that you can use to help cool your pooch during the summer. There are also cooling beds. However, given that beds are bulkier and require some form of assembly limiting their usefulness to permanent areas, cooling pads are preferred. These can be easily folded or even rolled to be stored or carried on trips. Technically, you can bring these pads anywhere you go. Like all things, dog cooling mats should also be easy to clean. The good news is that majority of these products today come with waterproof materials that you can easily wipe clean. However, do take note that these are still essentially made of fabric materials. You should never use any chemical or cleaning solution that might degrade the integrity of these materials. Cooling pads are one of those contraptions that pooches in warm climates really can benefit from. These products work by transferring heat from your dog and then dissipating this same heat into the environment. In choosing a product that best suits your pooch, you’d have to take a look at its thermal efficiency, portability, durability, and ease of cleaning and/or maintenance. And if you have doubts about where you should start, our list of the best cooling pads for dogs will give you a head start.